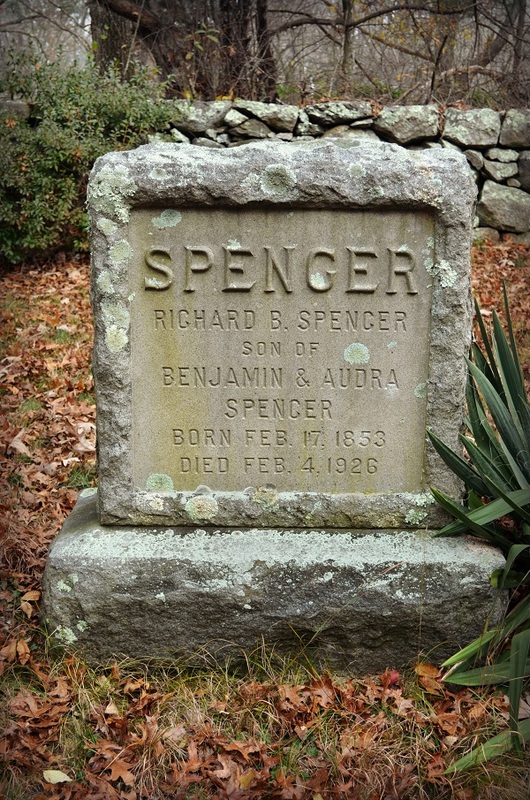 According to Audrey Mae’s artistically designed cemetery map and Audrey Mae’s gravestone numbering system in her Spencer Historical Family Cemetery, Richard Benjamin Spencer’s gravestone is Gravestone Number Fifty-Two. 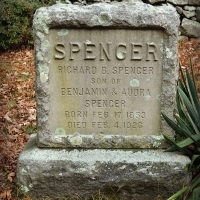 Using her Smith-Corona typewriter in the 1980s, Audrey Mae typed the following mini-biography of Richard Benjamin Spencer, an eighth-generation Spencer in East Greenwich, Rhode Island. (2012 update: Reading the gravestone, Audrey Mae’s granddaughter notes 1853 as the birth year for Richard Benjamin. Also, Bruce MacGunnigle’s book report 1853). Audrey Mae reports that Richard Benjamin was married to Harriet Wells Bates. Web author has no information on Harriet. Although Audrey Mae does not mention this in Roby Alice’s mini-biography, web site author believes that Roby Alice (née Spencer) Rathbun (gravestone No. 48) is also a sibling of Richard Benjamin. Audrey Mae mentions that two Spencer sisters married two Rathbun brothers. The Rathbun brothers’, John’s and George’s, news articles mentions the brothers marrying two daughters of Benjamin Spencer. This entry was posted in All Gravestones, Born into the Spencer line, on December 17, 2012 by Heather.